It was 1080 minutes of AWESOME! I just love the reader, Khristine Hvam, who also read the first two books in the series, Daughter of Smoke and Bone and Days of Blood and Starlight. I now consider myself an audiobook junkie and Khristine Hvam is my second favorite audiobook reader to Jim Dale who read the Harry Potter’s Series (which is like saying she is second to the god of audiobooks). It doesn’t hurt that Laini Taylor is also a genius, as is her incredible (or should I say awesome?) series. But, my point is that you probably need to like this story to appreciate Khristine’s mad audiobook reading skillz (and yes, that is a thing). 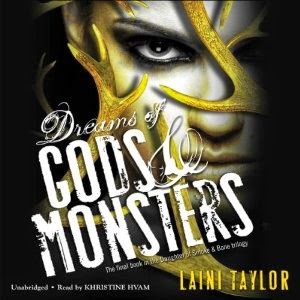 So, be sure to check out Andye’s review before you start Dreams of Gods and Monsters. I don’t want you to commit sacrilege by briefly considering that you might not like the reader, when oh, you really do. Just do yourself (and Khristine) a favor and consider whether you will like the book(s) or not first. Honestly, though, considering the sheer brilliance of Dreams Of Gods and Monsters, I’m totally just being hypothetical. Oh ya. And my husband, who really thinks romance stories are stupid and, well, stupid, listened to and enjoyed Dreams of Gods and Monsters with me for 20 or so hours on a trip (a really really elongated trip, thanks to the interruptions of the thousands kids in the back seats). He also really liked Days of Blood and Starlight probably just because it was READ BY KHRISTINE HVAM on audio (though I guess it couldn’t hurt that it was pretty much fantasy war rather than romance, too). Considering I’m guessing you don’t have mad audiobook-reading skillz, do yourself a favor and check this (and all books read by Khristine) out. I LOVE this series! I listen to the second book in audio, but not this one. Such an amazing series. Do you feel there is companion book in the horizon? I actually asked her about that, and she said she did have a companion in mind when she wrote it, but that she had to put it on the back burner.